Citoyen du Monde, by Beninese artist Meschac Gaba, is the newest installment of the park’s ongoing “Broadway Billboard” series, through which Socrates Sculpture Park commissions artists to create a billboard image that spans the main entrance of the park and offers a unique platform for exhibiting two-dimensional media. At least twice annually (spring and fall), Socrates installs a new work on the 11′ x 28′ billboard, which can be seen nearly a mile away on Broadway in Long Island City. 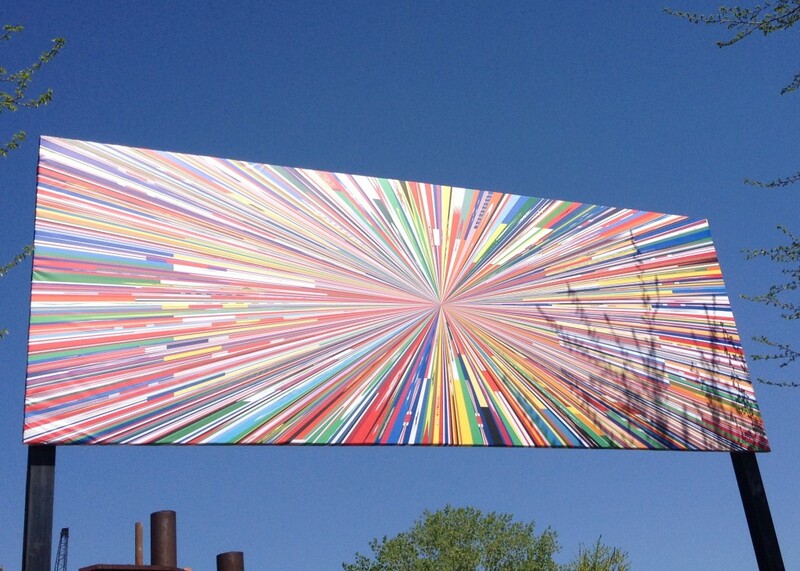 The piece is the artist’s vision for a global flag. Created by elongating individual flags from every country in the world into narrow triangles that converge at a central point, this optically spectacular work presents a humorous image of idealism and optimism for resolutions to the difficulties and crises that divide our world. The singularity of each flag is lost in the rhythm of the composition as is the case in the age of globalization where national borders merge into the international. Greeting visitors at the entrance to the park, this large scale utopic graphic broadcasts a message of unity that reflects Socrates’ mission to introduce art to the broadest spectrum of people possible. Citoyen du Monde is presented courtesy of the artist, Stevenson, Cape Town and Johannesburg, and Tanya Bonakdar Gallery, New York.